In the summer of 1976, the waters off the New Jersey coast became severely depleted in oxygen. The event devastated the states marine fisheries, predominantly the surf clam industry, and caused economic losses in excess of half a billion dollars. Smaller such events have continued to plague the New Jersey coast ever since. Now researchers say that ocean processes, not river runoff, are responsible for the oxygen depletion and the resulting hazards that the events pose to bottom-dwelling organisms. Rutgers University researchers deploy a robotic underwater glider to look for red tides  large, sometimes toxic algal blooms  in Florida. Oceanographers are using the same technology to better understand the development of low-oxygen areas that threaten shellfish offshore of New Jersey. Photo courtesy of Chris Higham, Mote Marine Lab. The oxygen depletion, called hypoxia, often occurs offshore of rivers that drain heavily populated and industrialized areas, such as the Hudson and Raritan. This observation led scientists to suspect a terrestrial source of the nutrient pollution responsible for the hypoxia, as in the Gulf of Mexico. In the Gulf each summer, the Mississippi River brings excess nutrients  nitrogen and phosphorus from agriculture, industry and population centers  that fuel massive blooms of phytoplankton. The ultimate death and bacterial decay of billions of these tiny marine organisms depletes oxygen from the bottom waters, creating a dead zone similar to, though more extensive and more severe than, the zone off New Jersey. However, the river hypothesis did not fully explain all the observations offshore of New Jersey. For example, certain nonindustrialized estuaries, such as that of the Mullica River, which drains the watershed of the pristine Pinelands National Reserve, still experience recurrent hypoxia. Additionally, events up and down the coast seemed to coincide with strong southerly winds. Now, Scott Glenn, an oceanographer at Rutgers Universitys Institute of Marine and Coastal Sciences in New Brunswick, N.J., and colleagues say that the source of the nutrients and the phytoplankton is the sea and not the land. As reported in the Dec. 24 Journal of Geophysical Research  Oceans, they monitored the Mullica River estuary between 1993 and 2001, and found that regions of coastal upwelling coincide with historical regions of hypoxia. The centers of coastal upwelling, they write, form where large cold-water eddies encounter the bumps in underwater topography caused by ancient river deltas. The disrupted flow, combined with certain wind conditions, creates subsurface jets of cold water that shoot onto the inner shelf, carrying abundant amounts of nutrients and phytoplankton with them that cause the ensuing bloom. It is much more complicated than we thought, Glenn says. It means we have to consider the entire New Jersey shelf when we look at coastal hypoxia. He adds, however, that rivers may still be involved in some way, as the team has identified areas were river water is regularly transported up to 60 kilometers offshore. This water, or areas farther offshore, still may ultimately prove to be the original source of the phytoplankton and nutrients. The decade-long study coincided with the development of new technologies and the improvement and expansion of coastal monitoring efforts in the Mid-Atlantic bight. 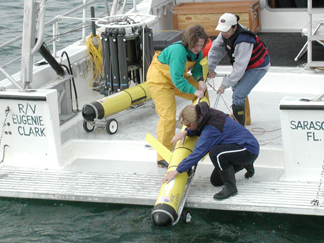 Along with traditional oceanographic techniques, the researchers used satellite and radar technology to monitor ocean temperature, currents and color (an indicator of phytoplankton concentration), as well as autonomous robots, called gliders, that can remain at sea for 30 days to continuously monitor dissolved oxygen levels near the seafloor. Hopefully, this technology will get us closer to identifying where the problem is coming from and how we will fix it, Glenn says.